This picture is pretty After School Special. It sould be fine on the small screen. As generic as a message movie can be, "Remember the Titans" is a stirring and gratifying "true story" which nonetheless plays like it was written by a computer and directed by someone consulting an instruction manual before every take. Based on the life of the man who coached the first integrated high school football team in Virginia, circa 1971, it's a blatantly manipulative feel-good flick that is a virtual encyclopedia of racial strife clichés, sports clichés and unforgivably shopworn warm-fuzzy moments like the ubiquitous Motown-sing-a-long scene in which characters line dance and croon into hairbrushes or other substitute microphones. There's four -- count 'em four -- such scenes in this picture. The football games are filmed so uncreatively they might as well be stock footage filched from 100 other forgotten big-screen gridiron yarns. Aside from being distinctively black or white, the ensemble of ballplayers are mostly nondescript, interchangeable broad-shouldered lummoxes from central casting. What's more, the story is so predictable that you'll know exactly who gets kicked off the team and when, and you'll realize an inevitable "surprise" tragedy is looming as soon as everything seems to be going just a little too perfectly for the team before the last-reel Big Game that goes down to the wire in the 4th quarter. So why on Earth did I like this movie? Believe me, I've been asking myself the same question, and it comes down to this: The whole picture is built on the inherent integrity of its two supremely talented leads: Denzel Washington and Will Patton. Starring as the black coach affirmative-actioned into the top football position at T.C. Williams High and his white assistant who had a winning head coaching record before being pushed aside, these two actors give this pre-fabricated house of cards a solid foundation that just cannot be shaken. The closest thing Hollywood has to Jimmy Stewart these days, Washington could do this upstanding citizen thing in his sleep. 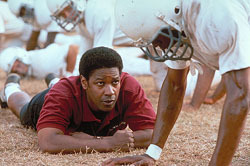 He exudes from every pore a passion for football, principles and justice in his role as Herman Boone, a man who really did stand up to racial prejudice in the early '70s by building a coalition football team of white and black players. Totally credible as an unrelenting coach who drives his players hard because he believes in them, Washington begins his uphill battle by forcing his divided and distrustful team to pair off and make friends across racial lines throughout the duration of his ferocious training camp. Astonished with their own ability to bond, they return to school as a cohesive unit of friends and teammates, only to find themselves defending their new kinship everywhere they turn (family, community, girlfriends) against the kind of bigotry they've only just learned to overcome. Coach Boone is on the spot as well. The school board had hoped he'd blow it in training camp so they could fire him. Now the word is, if he loses one game, he's out and Coach Yoast (Patton) gets his job back -- which becomes another potent personal struggle with ethics, thanks to Patton's strong pride-vs.-virtue performance. Written by sitcom refugee Gregory Allen Howard (not a computer after all) and lazily directed by Boaz Yakin ("A Price Above Rubies"), "Remember the Titans" has producer Jerry Bruckheimer's fingerprints all over it. A schlockmeister who has made a career of cranking out over-priced, over-produced, assembly line films for a lowest-common-denominator audience ("Days of Thunder," "Con Air," "Armageddon," "The Patriot"), Bruckheimer knows a cash cow when he sees one. "Remember the Titans" will be a hit because if nothing else it is a success as a stand-up-and-cheer crowd-pleaser. I could go on finding fault with this movie until I'm blue in the face (I really could have done without Patton's impish little girl, cloned from Jonathan Lipnicki DNA, who pops up every few scenes spouting adorably wise and rascally coaching advice). But that wouldn't change the fact that this is a good movie, in spite of its pandering, vanilla, cookie-cutter formulation and direction.